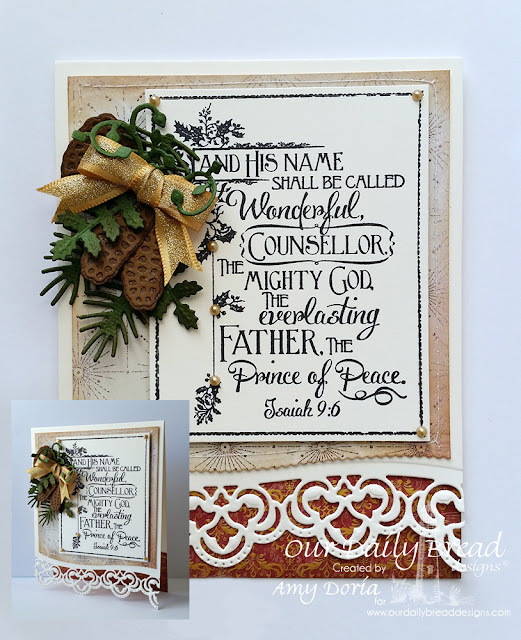 Welcome to Our Daily Bread Designs November Release and Blog Hop! This month's release is simply AMAZING! We have new Christmas stamps and dies! YAY! Check out the full release on the Our Daily Bread Designs Blog today! Three randomly selected winners will each receive a $25 gift certificate to the ODBD Store, to be used toward the purchase of ODBD Stamps found in the "ODBD stamps column" of the website just for commenting on the Design Team cards! You have until November 2, 2015 at 9:00 p.m. EST to leave your comments on the Designers Blogs for a chance to win! The Winners will be posted on the ODBD Blog on November 3rd, so be sure to check back there to see if you won! Fort his card I used the Leafy Edged Border Dies to make ad edge on the card base itself. I then added the pattern paper over it after I die cut, inked and machine stitched all around the edges, I stamped the sentiment and mounted it over the right side of the card with 3D foam adhesive. I die cut and assembles a few pine cones and added them as a bunch on the left side of the sentiment with some greenery and a gold bow. I added a die cut pattern paper to the inside so that you can see it when the card is closed. This card measures 5.5"x5.5". For this card, I stamped the sentiment and masked out the border so I could die cut it with the Elegant Embellishments Dies. I added a Layered Lacy Squares Die in gold over the red/gold snowflake pattern paper. I added the sentiment on the left side and two die cut ornaments on the right side. i finished both of these with a gold die cut bow. Love the ornaments! Very pretty! Hi Teamie. These are gorgeous cards in color, beautiful papers and combined CUTS! Two beautiful cards Amy!!! Love the pine cone spray in your first card; a perfect accent to a pretty card! Gold and red are always favs for me! Your second card is stunning! Gorgeous cards, Amy. I especially like the bows added to the ornaments and your open cut work border. The stamp in your first card is one of my favorites from the November release. 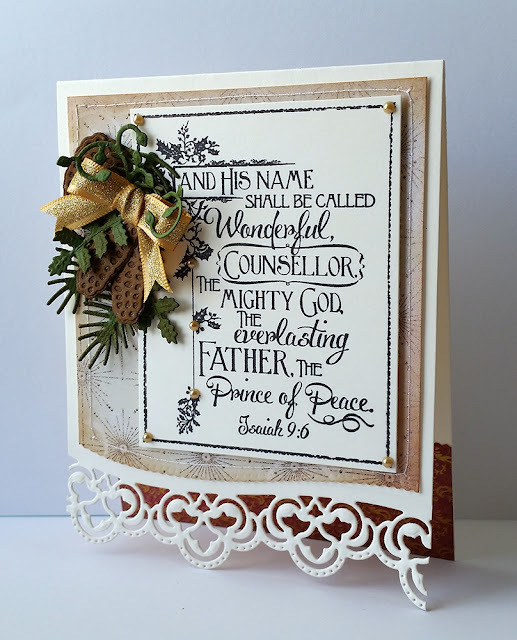 elequant cards beautiful Christmas spirit and inspiration love the ornaments and bows with the openwork lace. Both of your cards are so pretty and elegant! Love the gold and red one. Two totally gorgeous cards Amy! Love them! Gorgeous cards. Love those sentiments. Love the use of the bows. Also, really love the red and gold card as those colors go so well together. Absolutely beautiful cards Amy. I especially love the first one on the craft card.....and the beautiful verse. Both of your creations are gorgeous, Amy!! I just love all the texture and dimension!! 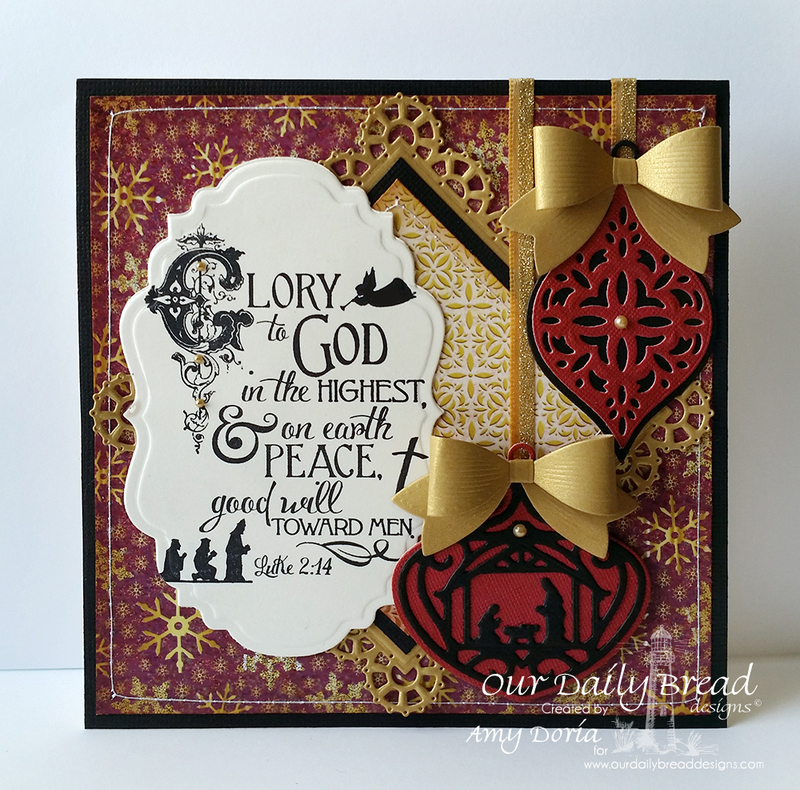 Your use of the bows with the ornaments is really beautiful especially with the verse and red, black and gold combo! Gorgeous layouts!! Beautiful designs. love the pine cones. The new bows and the lovely leaves dies are so pretty. The pine cones snuggled in with the bow is very pretty. Elegant second card with the gold bows and the sentiment. Beautiful cards!! 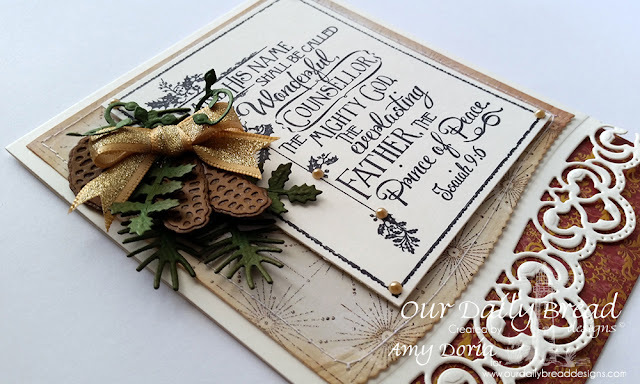 Love the die cut pines.. the ornaments are very beautiful!! How great to see beautiful cards. I have look at beautiful cards on the internet, by far yours are on my top of the list. So elegant. Every well coordinated. Love your cards. Keep them coming. 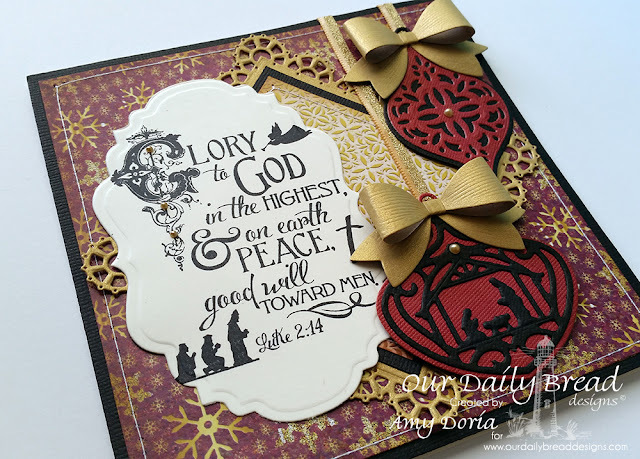 These large Christmas scripture stamps are gorgeous! Beautiful cards. Love the one with the ornaments. Wow! Love the rich elegance on these beauties! Excellent! These are absolutely gorgeous cards! Just lovely! Two beautiful dimensional cards. Love the colors. Gorgeous cards! The colours and depth of each card is amazing. Wow...two beautiful cards...Love all your elements!! Elegant cards! Love the pinecones and greenery! I love both cards, but love how you did the ornament card. I have the manger set and you have shown how to use it. Love! The Mighty God stamp is great and the card you made using it is fabulous as is your others! Gorgeous creations, Amy! Love the beautiful foliage and design with the border edge on your first card and the gorgeous rich colors on your ornament card! Fabulous release projects! Two beautiful samples, Amy!! Fabulous design on The Mighty God card! Beautiful pine spray! Love the bows on the ornaments on your second card!